Building a patio cover on my home was one of the best decisions I have ever made. I built this patio cover (available on mycarpentry.com) over 15 years ago and it is still standing strong and looking good. But there are scenarios where that design does not work. Maybe your existing roof was not designed to carry the additional load of a patio roof, or maybe local building code does not allow attaching a patio roof to your existing roof overhang. If this is the case, these almost-free-standing patio cover plans might be the design you are looking for. 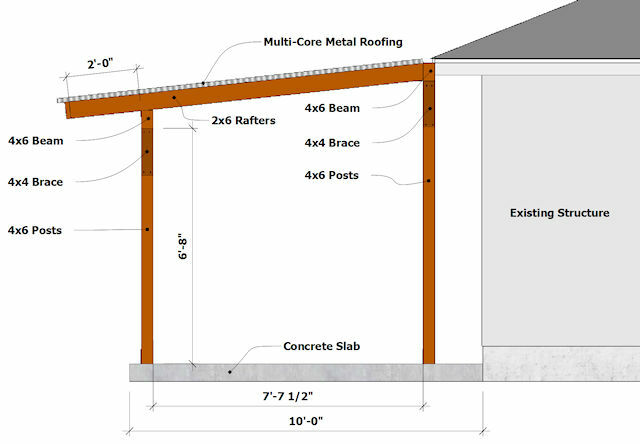 This new patio cover roof plan replaces the ledger board (that you might attach to existing fascia) with a 4x6 beam supported by 4x6 posts. 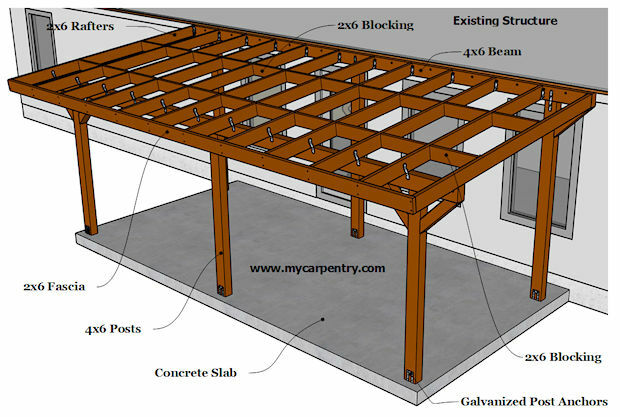 When the 4x6 beam is in place and supported by the 4x6 posts, the existing roof does not carry any of the weight of the new patio cover roof. This plan is almost free-standing, because the 4x6 beam does attach to the existing structure for stability. 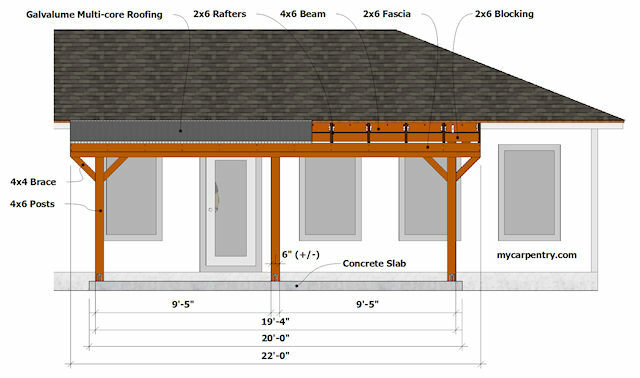 Overview: The new patio cover will be built using Western Red Cedar 4x6 posts, 4x6 beams, and 2x6 rafters (of course, you can use Pressure Treated Pine, Redwood, or any other suitable framing material to build your patio). The roof will be constructed using Multi-Core Galvalume metal roofing. 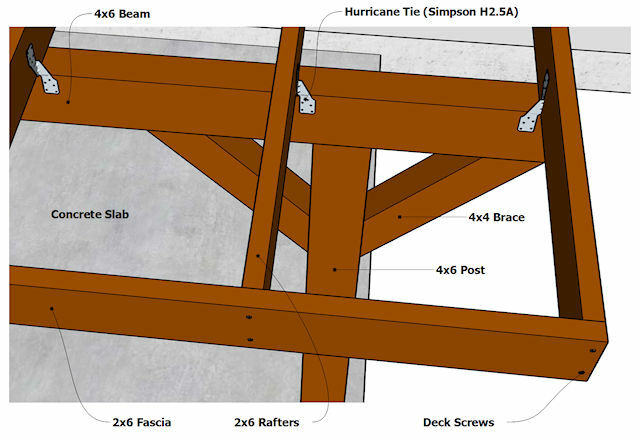 The posts will be attached to the slab using galvanized post anchors; and the rafters will be attached to the beams using various straps, ties, and joist hangers. Assumptions: A concrete patio slab is already in place with footings (at the locations of the 4x6 posts) capable of supporting the load of the new patio cover (including any continuous snow load). The footings are not shown in this example, since they vary considerably depending on your location and soil composition. The dimensions indicated in these drawings of the existing structure (size and elevation of the slab, roof overhang, etc.) are for example only. Your existing structure (and individual creativity) will enfluence your patio cover design and make it distinctive and unique. Since this patio cover design has supporting posts located close to the existing structure, I tried to position the patio cover and slab, so that the posts were not located directly in front of windows and doors. 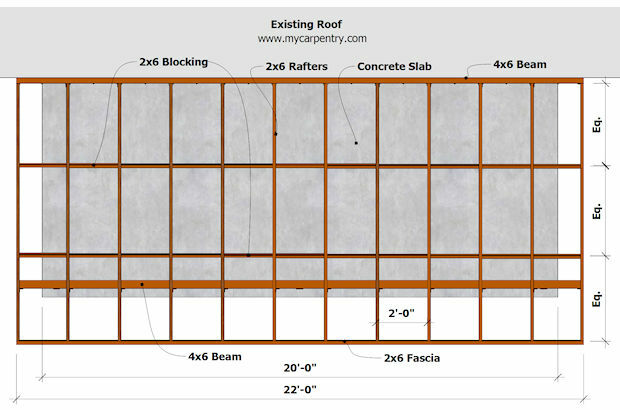 This patio cover plan example uses galvanized metal as the roofing material. You can alternatively use shingles as roofing material, providing the roof pitch on your patio cover falls within the shingle manufacturer's specifications. 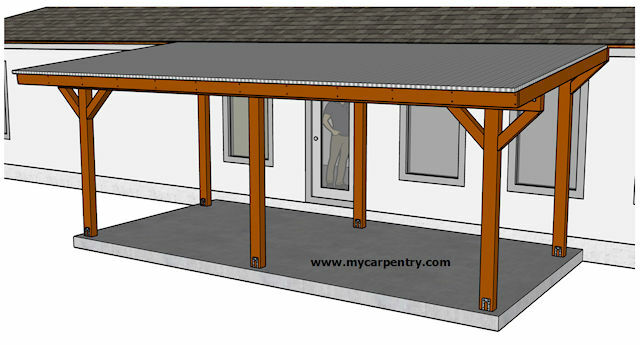 This patio cover on mycarpentry.com provides an example of a shingle roof design. On the above roof framing plan, 2x6 blocking was added as a method of attaching the metal roofing material to the roof structure (of course, there are other ways to do this). If you choose to use shingles on your patio cover, you can eliminate this blocking. 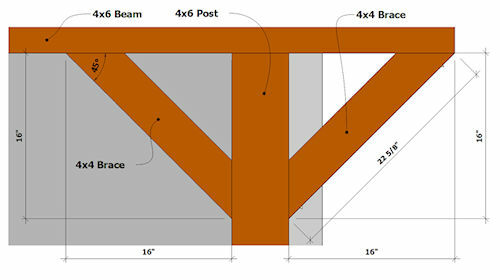 Tip: Purchasing 4x6 beams 22 feet long may be possible, but not very practical. I suggest purchasing the 4x6 beams @ 12'. You can cut each of them to the desired length and break the two sections in the middle of the center posts. 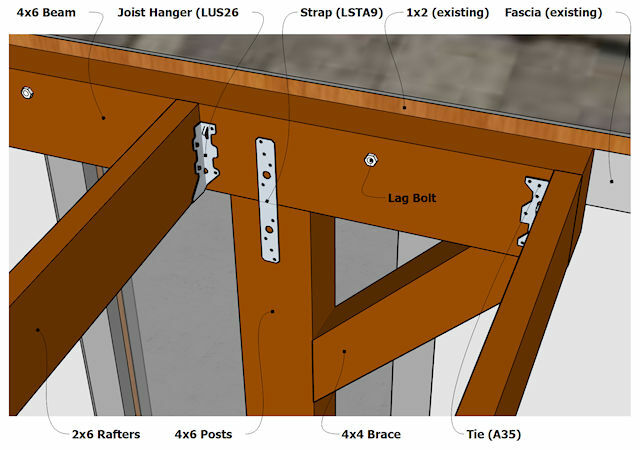 The above roof detail shows the upper beam attached to the existing structure (using lag screws), with the appropriate ties, straps, and joist hangers in place. Note: When installing any of the structural hardware, you might find it easier to initially toenail the rafters to the beams, to hold them in place, before you install the straps and ties. On the brace detail below, the beam extends past the 4x6 post 16". Using the Pythagorean Theorem you can determine the length (long point to long point) of the brace. I hope you find these plans useful, while you are designing, planning, and building a patio cover of your own. If you have any questions, please don't hesitate to Contact Us. Special note: These plans are not intended to replace engineered working drawings. Local building codes can vary significantly among the regions. Your local building code should determine the actual sizes of concrete footings, slabs, wood structural members, and fasteners to be used. 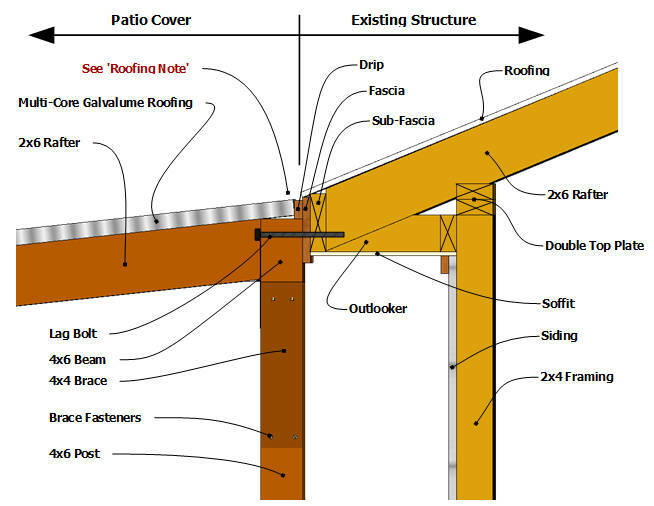 A structural engineer should determine if your existing structure is capable of supporting the additional load factors of a patio cover. Before beginning construction, contact your building permitting authorities to obtain a building permit and to have your design reviewed so that it complies with local building codes and guidelines.